I’m happy to meet with you today, and I thank you for your joyful welcome! In particular, I thank Madam President for the words she addressed to me on behalf of the whole Movement, and for the contents she expressed, recalling your mission at the service of life and the importance of the Day, which will be observed tomorrow in the whole of Italy. The Pro-Life Day, instituted 41 years ago, by the initiative of the Italian Bishops, brings to light every year the primary value of human life and the absolute duty to defend it, from conception to its natural end. And, as a general premise, I would like to stress something in connection with this. To take care of life exacts doing so during the whole of life, and up to the end. And it also calls to give attention to the conditions of life: health, education, work opportunities, and so on. In sum, all that enables a person to live in a fitting way. Therefore, the defense of life is not carried out in only one way, or with one gesture, but it’s done in a multiplicity of actions, attentions, and initiatives; nor does it concern some persons or certain professional realms, but it involves every citizen and the complex web of social relations. 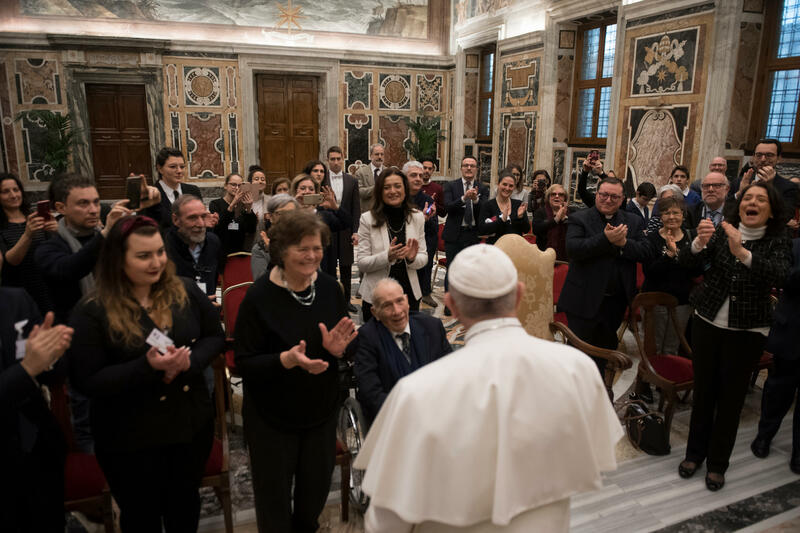 Aware of this, the Pro-Life Movement — present in the whole Italian territory, through Centers and Services of aid to life and Reception Houses and through its multiple initiatives –, has for 43 years made an effort to be leaven to spread a style and practices of reception and respect for life in the whole “dough” of society. The latter must always be a jealous and firm custodian of life, because “Life Is Future,” as the Bishops’ Message reminds us. Only if room is made for it, can one look ahead and do so with trust. See why the defense of life has its fulcrum in the reception of the one generated and who is still protected in the maternal womb, enveloped in the mother’s womb as in one loving embrace that unites them. I appreciate the theme chosen this year for the European Competition proposed to schools: “I take care of you. The Model of Maternity.” It invites to look at conception and birth not as a mechanical or only physical event, but from the viewpoint of the relationship and communion that unites the woman and her child. This year’s Pro-Life Day recalls a passage of the prophet Isaiah, which moves us every time, recalling to us God’s wonderful work. “Behold, I am doing a new thing!” (Isaiah 43:19), says the Lord, letting His ever young heart filter through and His enthusiasm in generating, every time, as at the beginning, something that wasn’t before and brings an unexpected beauty. “Do you not perceive it?” adds God by the mouth of the prophet, to shake us from our torpor. “How is it possible that you do not perceive the miracle that is wrought in fact under your eyes?” And we, how can we consider it a work of our own, to <the point of> feeling we have the right to dispose of it at our pleasure? To extinguish life voluntarily in its budding is, in any case, a betrayal of our vocation, in addition to the pact that binds the generations among themselves, a pact that enables us to look ahead with hope. Where there is life, there is hope! However, if life itself is violated in its beginning, what remains is no longer the grateful and amazed reception of the gift, but rather a cold calculation of that we can dispose of. Then life is also reduced to a good of consumption, to be used for ourselves and for others, or discarded. How tragic this vision is, unfortunately, widespread and rooted, and how much suffering it causes the weakest of our brothers! We, however, never resign ourselves, but we continue to operate, knowing our limitations but also the power of God, who every day looks at us, His children, with renewed amazement, and the efforts we make to let the good blossom. A particular sign of consolation comes from the presence among you of many young people. Dear boys and girls, you are a resource for the Pro-Life Movement, for the Church and for society, and it’s good that you dedicate time and energies for the protection of life and the support of the most vulnerable. This makes you stronger and as a flywheel of renewal also for those that are older than you. I want to thank your Movement for its attachment, always declared and acted, to the Catholic faith and to the Church, which renders you explicit and courageous witnesses of the Lord Jesus. And, at the same time, I appreciate the secular nature with which you present yourselves and operate, a secular nature founded on the truth of the good of life, which is a human and civil value and, as such, calls to be recognized by all persons of good will, of whatever religion or creed they belong. In your cultural action you have witnessed frankly that all those that are conceived are children of the whole society, and their killing in an enormous number, with the endorsement of the States, is a grave problem that undermines at the base the building of justice, compromising the correct solution of any other human and social issue. In view of tomorrow’s Pro-Life Day, I take this occasion to make an appeal to all politicians so that, regardless of the each one’s convictions of faith., may put as the first rock of the common good the defense of the life of those that are about to be born and make their entrance in society, to which they bring novelty, a future and hope. May they not let themselves be conditioned by logics that look only to personal success or immediate or partisan interests, but always look far, and look at all with the heart. Let us ask God with trust that the Pro-Life Day that we are about to observe, may bring a breath of fresh air, enable all to reflect and commit themselves generously, beginning by families and all those that operate in responsible roles, at the service of life. May the joy of witness, in fraternal communion, be given to each one of us. I bless you affectionately and I ask you, please, not to forget to pray for me.